PRICE REDUCTION! This highly desirable 125 acre Peoria County tract is truly nothing short of spectacular! The property is located less than a mile South of Wildlife Prairie Park on Taylor Road, less that 15 minutes from downtown Peoria and just a few miles from I74. City water and electricity is already on the property which is very valuable for future development. 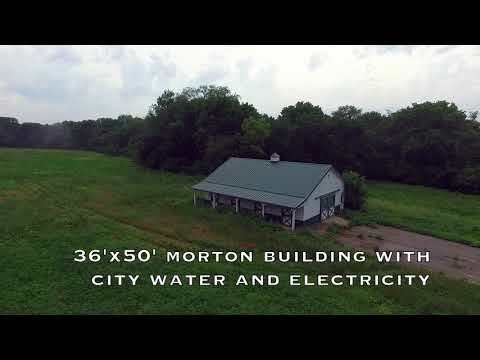 The 30 x 50 Morton Building on the property would be ideal for a hunting lodge or used as a horse barn. City water and electricity are already connected to the building. The 125 acre Peoria County tract is made up of rolling mature timber, creeks, food plots, 11 acres tillable and a well established road system throughout. A highly regarded timber buyer recently walked the property and gave a conservative walnut value of $50,000! This number is based off of a very selective harvest of walnuts only! Among the valuable walnuts are massive oaks which create a very viable food source for all the wildlife throughout the property. The 3 creeks that meander through the farm offer a great year round water source. Multiple strategically placed food plots throughout the tract create a virtual oasis surrounded by the massive block of timber! There are additional areas for future food plots on top of what is already in place. Over the years this area of Peoria County has been known to produce some giant whitetails! The NW corner of the tract borders a huge property owned by the Peoria County which allows no hunting. This serves as a giant refuge giving these deer a great opportunity to grow to full maturity. The neighboring property owners have been practicing QDMA for many years! The owners of this 125 acre tract have done little to no hunting on the property since they purchased it over 20 years ago. They have allowed very few people to hunt over the years!